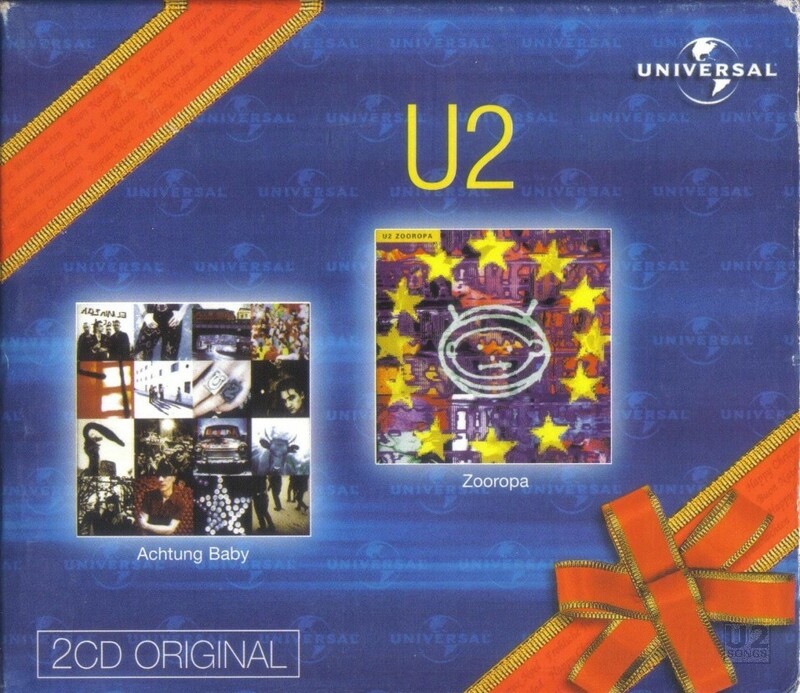 At the end of 1999, Universal put together a boxed set containing two albums, Achtung Baby and Zooropa. These were French pressings of the albums, and the box was released throughout Europe. u2.com states that this was a German pressing, but the only copies we have seen have been from France. The box itself was designed by Haymarket, and was a blue box with the Universal Music logo repeated over the cover. On the corners was a red “ribbon” design, filled with holiday greetings such as “Feliz Navidad” and “Merry Christmas”. On the front of the box there was a bow in the design. The front cover contained the cover images for both albums, and the back cover contained the track listings. The CDs contained in this set were made by Universal M&L in France, and this is stated on the underside of the CD, although the label side of Achtung Baby says “Made in France by PMDC”. Both CD cases have a round black sticker with a white dot in the center affixed to the outside of the jewel case. This may have been some sort of theft protection system. The CDs available here were also made available for sale commercially separate from the box.